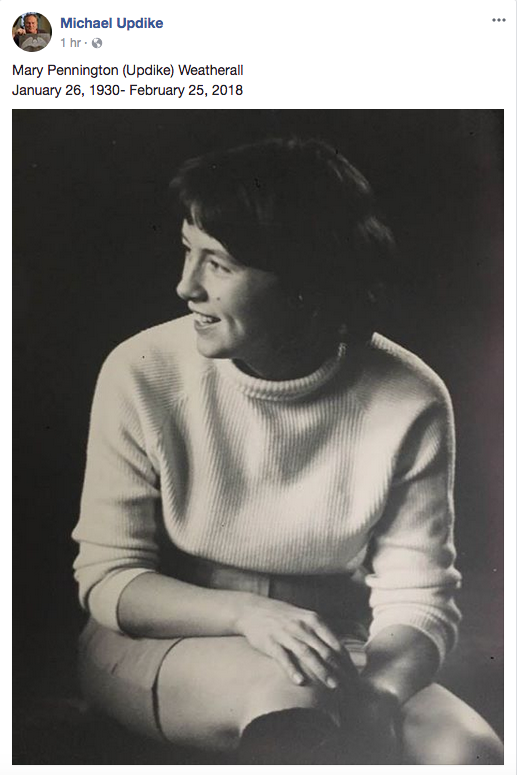 All of us at The John Updike Society were saddened to see the notice that Michael Updike just posted on Facebook that his mother, Mary Pennington (Updike) Weatherall, has died. Mary, John Updike’s first wife and the mother of his four children, was a supporter of the society from the very beginning. She donated money to help us restore the childhood home, donated objects for display that once belonged to Updike, took part in a family panel at the first conference in Reading, Pa., and even welcomed into her home all who attended the second conference in Boston. We offer our sympathies to the family but share in the feeling of tremendous loss. All who were privileged to meet and spend any time with Mary know how warm and kind and generous she was, and how helpful she has been to Updike scholars over the years. She will be sorely missed, and our hearts go out to her children, Elizabeth Cobblah Updike, David Updike, Michael Updike, and Miranda Updike and their families. We will post more information as we receive it.